Tour Ephesus hassle free with no shopping visits! 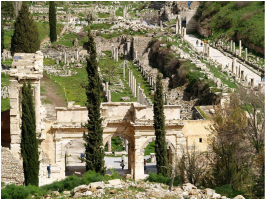 Join our daily NO FRILLS EPHESUS TOUR which departs from Selcuk and will take you to the Ancient City of Ephesus, undoubtedly one of the most important religion, cultural and trading centers of its time. is a great option for those of you who wish to absorb the culture and history of this magnificent ancient city without the hassle of being taken to various shopping outlets along the way. You will visit the Temple of Artemis, one of the seven wonders of the ancient world & the Ancient City of Ephesus before returning to Selcuk to visit the Archaeological Museum of Ephesus where you will find many of the original artifacts that have been unearthed through excavation. Includes :﻿ A/C vehicle, licensed English speaking tour guide & all entry fees. Excludes : Gratitude to driver/guide and lunch. MINIMUM 4 PEOPLE REQUIRED FOR TOUR TO DEPART. Catch the train from Basmane Train Station in Izmir to Selcuk Train Station and join our daily tour from there. Ephesus can get very hot during the summer months and there is minimal shade so we advise you to take sunscreen, a hat, plenty of water and of course your camera! Includes : A/C vehicle, licensed English speaking tour guide & all entry fees. Please select your tour option - this tour Includes : A/C vehicle, licensed English speaking tour guide & all entry fees. Please select your add - ons. If you dont wish to add any add - ons please continue with your booking. If you cancel at least 7 day(s) in advance of the scheduled departure, there is a 10 Euro administration fee. Chris, Mehmet and Mete, thank-you for the most fantastic day at Ephesus. 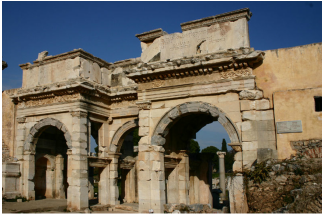 I research many options online in advance of my holiday bookings to find the best options for us and I wanted the Ephesus experience that would give us the most time at the archeological site seeing the things we wanted to see. We got that with a really engaging driver (Mehmet) and guide (Mete) as well. We were met at the ferry port terminal right on time and Mehmet and Mete were waiting for us as promised. Mete is the best guide - so engaging and knowledgable about his subject matter, and just such a genuine person too - so wonderful to talk to over lunch. We loved seeing the Terrace Houses at the site - don't miss this as it really gives you a perspective on life during the peak time in Ephesus. We did the trip as a day trip from Samos in Greece where we were staying. In the end it was easy but no one can confirm the ferry times from Samos until the end of May (for the summer season), so don't even try organising it before then if you are trying to do it from Samos. If you are intending on doing it from Samos, once the ferry times are confirmed, it was very easy to do. The trip took a bit over one hour from Samos. Both ferries out and back were on time. The booking process for our Ephesus tour was made very easy by Chris (who is a native English speaker) and all communication was really clear and prompt. We would love to come back and see more of Turkey and we would definitely use No Frills again (and perhaps get to meet Ted the dog next time!). We are generally independent travellers but found that the quality of the guide with No Frills really made the day great for us at Ephesus and added to the quality of the experience. I'm not sure why anyone would use any other company for their Ephesus Tour. They are very professional, friendly, do what they promise, and the guide is top quality.